Most of us spent a large portion of last year spinning our wheels on indoor bikes. But now, we may find ourselves spending more time strapped to an entirely different piece of equipment: the rower. It began slowly, but the rowing trend has taken off with a flurry of studios sprouting up in neighborhoods all over. (And, did any fellow Netflix addicts notice that Claire Underwood went from running to rowing in House of Cards season two?) Never one to miss out on a new fitness trend, I booked myself a few classes at CityRow. Conveniently located a few doors from Hu Kitchen (ideal for grabbing a post-workout smoothie), CityRow, which opened in January, offers a variety of different classes all featuring the rower. While they aren’t new, they're sort of the red-headed stepchild of gym equipment. There’s usually no more than two per gym (if any), compared to countless ellipticals, bikes, and treadmills, and they never really seem to “fit in” with the other equipment. But, thanks in part to workouts like CrossFit, which often incorporate cardio bursts on the rower, they’re receiving newfound attention. 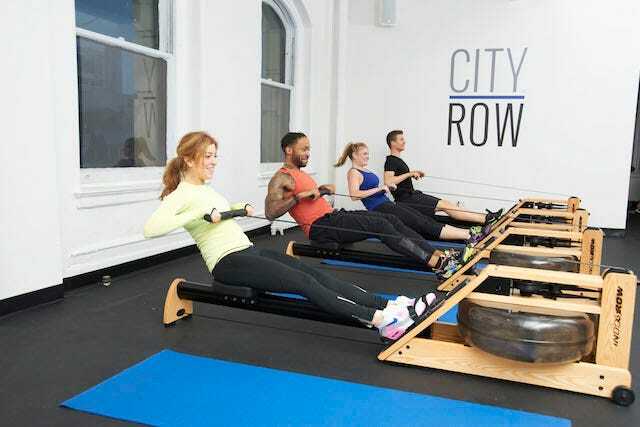 In order to get a well-rounded education in rowing, I tried two of CityRow’s most popular classes – Signature Row and the yoga-inspired Row & Flow. 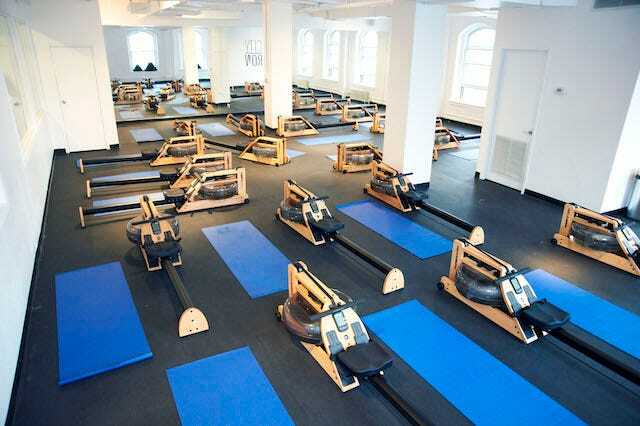 The airy studio offers an incredible view from its location just south of Union Square and features Indo-Row WaterRowers, which simulate the resistance (and sounds) of rowing in water with their signature WaterFlywheel. Each rower is accompanied by a yoga mat, and spaced generously apart so there’s plenty of personal room. Signature Row is equally challenging for rowing novices (like myself) and experts alike, and is structured by high-intensity intervals, alternating between six minutes (which doesn’t sound so bad) on the rower followed by weight and mat exercises to work the core, arms, and legs. I arrived early for my class and instructor Shaun explained what to expect and made sure I knew the correct way to use the machine. There’s a general misconception that rowing is primarily an arm/shoulder workout, but I quickly learned that when done correctly, the core and legs do most of the work. The class began with a few minutes of “warm up” on the rower, and I knew it was going to be a long 60 minutes. I cross-train, mix up my workouts, and am proud of my ability to climb for 45 consecutive minutes on the stairmill, but two minutes of rowing requires a different kind of endurance. Just when I thought I didn’t have anything left in me, the six-minute interval was up, and we moved to the mat for planks, push-ups and burpees. After a few more rounds of this, I was drenched. My verdict: Signature Row is intense, challenging, and works you just as hard (although in a different way, using different muscle groups) as a bootcamp or high-intensity cycling class. Row & Flow, which incorporates vinyasa, offers a nice a complement to Signature Row’s more intense, bootcamp-y nature. I took a class with Annie Mulgrew, the mastermind behind the creation of Row & Flow. Annie, who has a background in yoga and is the Program Director for CityRow, put together Row & Flow to combine the cardio benefits of rowing with the core-strengthening and tension-reducing benefits of vinyasa yoga. The class began with 18 straight minutes on the rower, including a few sprints, and then went into a vinyasa on the mat. Eighteen minutes sounded like an eternity, but combined with great music and a few sprints, it went by surprisingly fast. My favorite part of the class, however, was the yoga. Annie gave clear instructions and frequently came over to make adjustments so that everyone in the class was holding their poses correctly and getting the maximum benefits. I wasn’t nearly as sweaty after Row & Flow as I was after Signature Row, but I left feeling clear-headed and energized. My verdict: If you’d rather be in crow pose than on a stationary bike, but still want some cardio, this is your class. CityRow is located at 80 Fifth Avenue, Suite 1501, New York, NY 10011. For more information or to book classes, please visit their website or email info@cityrow.com. Note: they do not have locker rooms at this time, so please plan accordingly.